The House Intel Committee has invited former Acting Attorney General Sally Yates and several other high level figures to testify at hearings about the Trump team's involvement with Russia. The White House's earlier attempts to block Yates from testifying are proving futile. 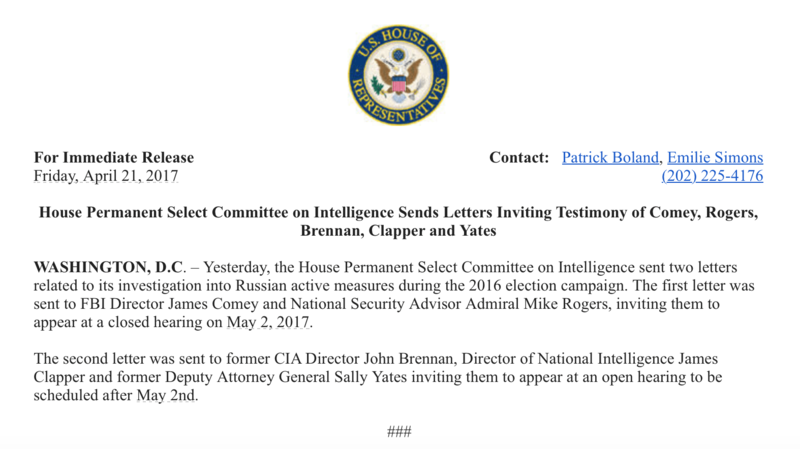 The House Select Committee on Intelligence has sent letters inviting multiple pivotal figures — including former Acting Attorney General Sally Yates — to testify before the committee about links between Donald Trump and Russian active measures. In March, the White House attempted to block Yates from testifying by exerting executive privilege. However, Yates did not back down, and in the face of public outcry in response to the cover-up efforts, it appears the White House has backed off its attempts to prevent her testimony. These will be the first hearings held by the House Intel Committee on Russian active measures since Republican Representative Devin Nunes was forced to step aside from his position as chair of the investigation in the wake of the scandal regarding his interactions with the Trump White House. Nunes' replacement, GOP Representative Trey Gowdy, has previously threatened to hide all such investigations from the public, so the scheduling of a public hearing is particularly notable and lauditory. Nonetheless, the troubling consistency with which the majority of Republican lawmakers put party ahead of country reinforces the need for an independent, non-partisan investigatory body to investigate the web of ties between the Trump team and Russia.